MUOS ground station in the Naval Radio Transmitter Facility of Niscemi, Italy (Credits: Repubblica). In July 2013, MUOS-2, the second of a series of five satellites that form part of the Mobile User Objective System (MUOS), was launched aboard United Launch Alliance’s Atlas V from Space Launch Complex 41 at Cape Canaveral. Serving primarily the US Department of Defense, MUOS is a six billion dollar program that will enhance communications capabilities, replacing the US Navy’s UHF Follow-On (UFO) system. MUOS will be basically a cellular service provider using, instead of the 3G network and cell towers, the UHF SATCOM radio system and geosynchronous (GEO) satellites to guarantee communications coverage for US troops, even in disadvantageous environments. The first satellite was launched in February 2012 and the space segment will be operative with four satellites, while another one will be left inactive as in-orbit backup. The ground segment includes four ground stations, each of which serves one of the four active satellites. Two of the planned ground stations have already been built in Norfolk, Virginia and in Wahiawa, Hawaii while the other facilities, located at Kojarena, Western Australia and in Niscemi, a town in Sicily, Italy, have yet to be constructed. The MUOS facilities consist of three 19-meter antennas, two active and one backup, pointed to the GEO satellites to guarantee all-weather and all-terrain mobile communications. The supposed MUOS radio emission area according to Corraddu-Zucchetti report (Credits: Rino Strano). 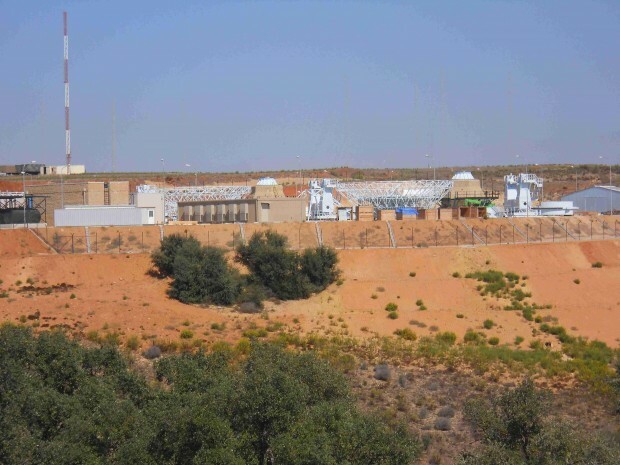 On August 9, hundreds of protesters gathered in front of the military base in Niscemi, where one of the MUOS ground station is in construction, resulting in a clash with Italian police. According to the angry mob, the antennas will be the cause of a huge electromagnetic pollution, dangerous for the inhabitants of the town but also for the animals of the natural reserve around the base. The Italian environmental agencies designated to investigate the matter concluded that the antennas would respect the severe limits imposed by the Italian legislation. The results were in accordance with the study ordered by the Sicilian government before giving permission to build the site in 2011. 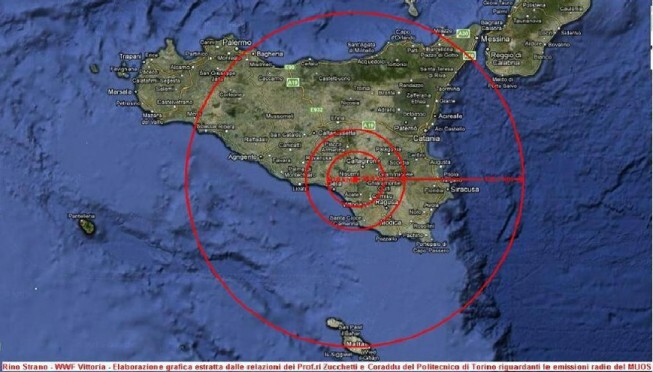 However, two experts from Politenico di Torino, Massimo Correddu and Massimo Zucchetti, hired by the town of Niscemi to assess the risk, have greatly criticized the study, saying that the ground station can be the source of many threats to the population. Correddu and Zucchetti have listed many possible risks that could happen, fostering the fear and the anger of the people living nearby. According to them, a mechanical failure or an earthquake could “move” the antenna, from pointing towards the satellites to a lower inclination, flooding the town with dangerous microwaves. Moreover, the antennas would be subjected to an effect called side lobe in which, along with the main emission lobe that is in the pointing direction, there are lower-intensity ancillary lobes that can cause radiation waste energy and interference with other equipment. In such a case, according to Correddu and Zuchetti, the lobes could endanger the population with high levels of radiation. However, the two experts claimed they could not calculate the radiation level and the position of these lobes because MUOS specifications were not disclosed. Last, but not least, they have also expressed concerns for possible interference with aircraft systems approaching the local airport of Comiso, about 30 km from the base. However, these assumptions do not consider the fact that even the other ground stations on US soil are built near cities, which are bigger than Niscemi, or airports with much more air traffic than Comiso. The US Embassy in Italy made efforts to debunk these claims in response to the frequently asked questions brought up by media and individuals. However, this official effort has not convinced the protesters and many “urban legends” such as the birth of deformed animals in the vicinity of the base, appeared and were amplified by social networks. The protesters have even attracted the attention not only of local politicians, but also of national political movements, with some of them riding the protest and clearly feeding the anti-American feeling that would like to see the military bases gone. The “NoMUOS” activists claim that the antennas would have a maximum power of 1600 W, but the official data released by the embassy reports an emission power of only 200 W, equal to three light bulbs. It is anyway not clear if, even with a power of 1600 W, the antennas would represent a health hazard for the population close the facility. It has also to be said that the Coreddu-Zucchetti study, which is the main study supporting NoMUOS claims, has been criticized for some elementary errors in the risk analysis, like saying that birds are cold-blooded animals. Moreover, the study is actually mainly about the 44 antennas previously built at the base. However, these antennas have never produced electromagnetic fields out of the limits imposed by Italian legislation, which are anyway more severe than international standards, which in turn are much higher than the proven human danger threshold. NoMUOS activists protesting close to the Naval Radio Transmitter Facility of Niscemi (Credits: Ansa). Although the Sicilian government has re-granted MUOS authorization, previously revoked because of the protests, the situation remains unstable, with the protesters trying to delay the construction with barricades on the streets that lead to the base. It is likely that these events will increase the cost of the ground station construction and this could represent quite a problem in this time of sequestration. The anti-MUOS protest in Italy has been used by petty politics to acquire easy consensus and it is probably already too late for scientific facts to prevail over irrational fear. MUOS antennas will produce an electromagnetic field that will affect people in Niscemi probably less than a bunch of people on a bus checking their Facebook status on their smartphones. However, protests should not be simply dismissed. Rigorous fact checking is the only way to clear the field from scaremongering with no real scientific ground. The existing MUOS station in the Hawaii, a place not certainly stranger to earthquake, is 20 kilometers from the Honolulu international airport and even closer to the town of Wahiawa, which is about 17000 people. The station has been active since February 2012 when MUOS-1 was launched and until now, US authority have not reported any problems or incidents concerning the air traffic or the population in the close proximity of the base. Space Safety Magazine has tried to get in contact with Massimo Zucchetti, author of the study about the risk of MUOS, but he has not yet replied to our questions. Thank you for posting something objective. The amount of fear mongering hogwash on the internet related to this project boggles my mind! Please continue to keep up the good work by publishing factual data and analysis. Sadly, as you state, it may be a bit late for logic and facts to prevail, but one can only hope…..